While it’s important to mind the environment year-round, sometimes we need a little reminder. This is why, starting in 1997, November 15th has become the day we remember our commitment to recycling to help the environment. On America Recycles Day, people all over the country can pledge to recycle more in their daily lives and even join a recycling event in their community. Most importantly, however, the day reminds us that ‘going green’ is truly essential for our future. America Recycles Day isn’t the only day we think about the importance of going green. During the recent presidential race, voters looked to the candidates’ stances on environmental issues and energy policy. In fact, 67 percent of voters ranked a candidate’s environmental policies as either important or very important. An even larger 77 percent said the same about the candidates’ energy policies. With climate change and the need for greener technologies, it’s impossible for businesses to ignore the benefit of going green for both the environment and their own bottom line. When it comes to hiring, for example, companies should be looking at the greenest and most environmentally efficient way of connecting with candidates: video interviewing. Video interviewing is truly a great way to cut down your carbon footprint. As a hiring platform, video interviewing is not only saving you time and money, but also it can be a powerful tool in the fight to save Mother Nature. Big hiring decisions often have to be made fast. You don’t want talented candidates slipping through your fingers because you dragged your feet making a job offer. At the same time, it’s hard to get everyone on your team on the same page. Some members of your hiring team might be slammed and have no time to attend an in-person meeting. Others might be traveling and therefore not even in your geographic region. During the traditional hiring process, it was necessary to get the team together to discuss top prospects and make final hiring decisions. But thanks to video interviewing, your hiring team’s location is no longer an insurmountable issue. Live video interviews can be recorded and shared with the whole team. Your team can also watch one-way video interviews straight from their mobile devices. Thanks to the team collaboration built into the system, notes, impressions, and discussions can be shared with the whole team no matter what zip code they call home. There’s no mileage necessary to collaborate on important hiring decisions and snap up the talented candidates your company needs. Mother Nature, and your workers’ packed schedules, will surely thank you. Flying a candidate across the country for an interview will leave your company with a fairly substantial carbon footprint. Not only is it not particularly environmentally-friendly, it’s also downright expensive. However, with the war for talent continuing to rage, you can’t really afford to limit your search to your geographic area. This is where video interviewing can really help your company find the best candidates and help the environment. Instead of flying out a talented candidate to meet the whole team, schedule a video interview instead. Video interviewing can save companies up to 67 percent of the traveling cost associated with hiring. Plus, you still get that same personal connection you would in any face-to-face meeting. Who knew that going green could actually save you money? During the hiring process, resumes often end up eating a lot of paper. Many hiring managers will print out a candidate’s resume to have a hard copy to review, and most candidates will bring at least one printed copy of their resume to an in-person interview. In the spirit of America Recycles Day, you could nix the tree-killing paper and instruct candidates to use a video resume as a way to cut down on needless paper pushing. Plus, in a video resume, you can more clearly see a candidate’s communication skills, personality, and passion for the job. By encouraging candidates to record a video resume, you save a tree while actually getting to know them better even earlier than during the traditional hiring process. On America Recycles Day, it’s important to remember Mother Nature needs our help. It’s essential we all do our part to protect our environment. Video interviewing and video resumes are simple ways to make your company a little bit greener- and make the hiring process a little bit easier and more cost-effective. How is your company going to celebrate America Recycles Day? What green initiatives do you have in your hiring process? Share in the comments! 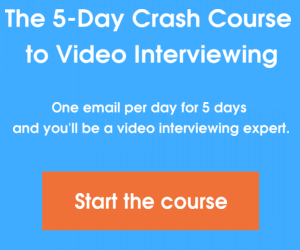 How Do I Video Interview… Candidates Reentering the Workforce?